The purpose of this article is to prepare the user for the Certified SOLIDWORKS Professional exam (CSWP), specifically by focusing on segment 1. Segment 1 focuses on the creation of a part from a drawing, using linked dimensions/equations, identifying mass properties, and modifying geometry. The actual exam is 5 questions each weighted with a different amount of points. There is a 90 minute time limit, and the user must get 85 points to pass out of a possible 115 points. The exam will consist of both multiple choice answers and fill in the blank answers. One tip for taking the exam is that multiple choice answers will be exact. If the answer from the users work does not match, go back and check again. Before I move on with details of the Solidworks certification – I strongly recommend getting our 100 CAD Exercises eBOOK ! There are three main levels of SOLIDWORKS certifications. The CSWA (Certified SOLIDWORKS Associate), CSWP (Certified SOLIDWORKS Professional), and CSWE (Certified SOLIDWORKS Expert). The CSWA certification is proof of the users SOLIDWORKS expertise. It is seen by many as a starting point for high school or college students who are looking to prove to prospective employers that they know the SOLIDWORKS software. 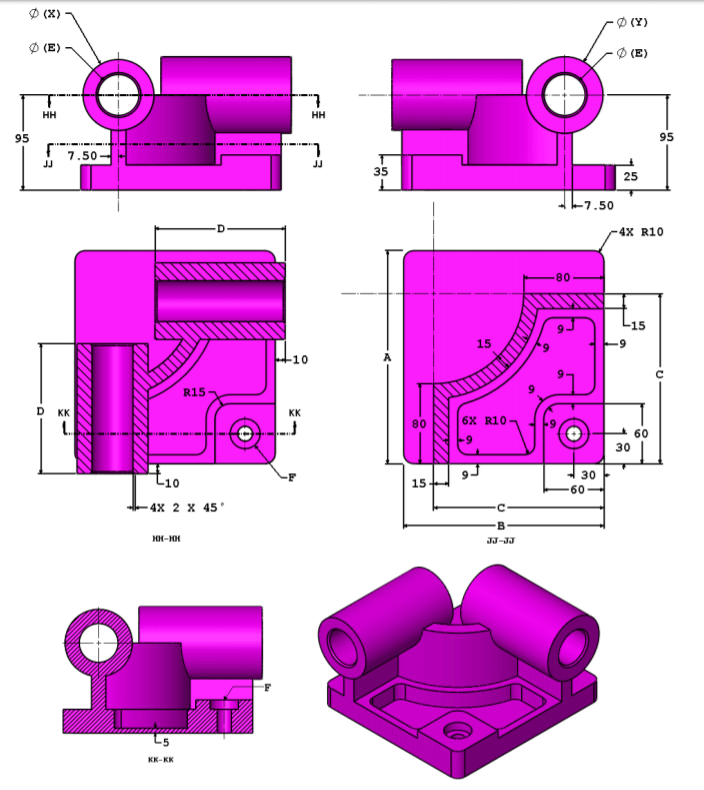 To further enhance their professional career, a higher level of CAD certification is necessary. The CSWP certification is proof of the ability of the user to design and analyze parametric parts and moveable assemblies using a variety of complex features. The most formidable test in the SOLIDWORKS certification program is the CSWE. To be eligible for this test, users must already have a CSWP certification, as well as, successfully completed four of the five individual advanced topics exams. The CSWE certification is proof of the users well rounded knowledge of all areas of the SOLIDWORKS software. At the time this article is being written there are 182,701 users with a CSWA, 85,502 with a CSWP, and 3,333 with a CSWE. The current version of the CSWP exam is broken into three segments. The segments can be taken in any order and are not dependent upon each other. Once a segment is passed, it will not need to be taken again if other segments are failed. 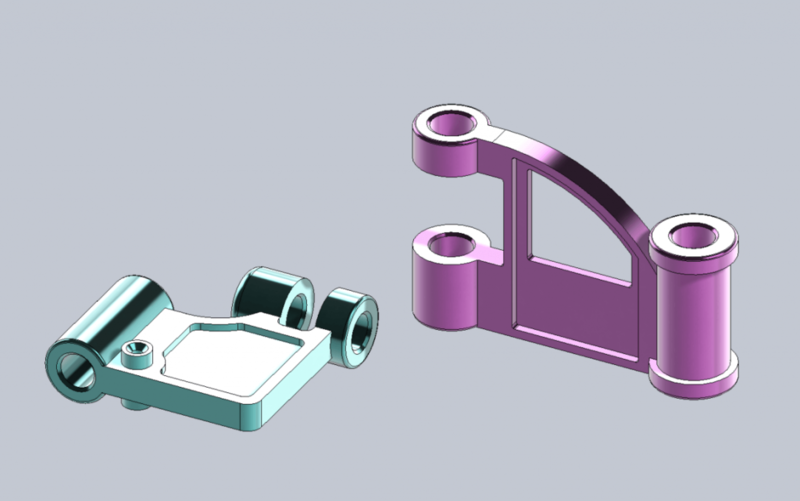 Once all three segments have been successfully completed, SOLIDWORKS will send the CSWP Certification. SOLIDWORKS does provide a sample exam that can be downloaded here. It is a good example of the segment 1 exam. Question 1 of the exam will be presented in as follows. A drawing of the part will be presented with numerical dimensions, as well as, alphabetical variables. There will be a text explanation to address all of the alphabetic characters, units of measure, and material properties. Another tip is to add the alphabetic characters as global variables first. The user will have to edit the value in the forthcoming questions, so establish these early and use them often. When dimensioning the part, type in the alphabetic character and select it in the global variable drop down menu. 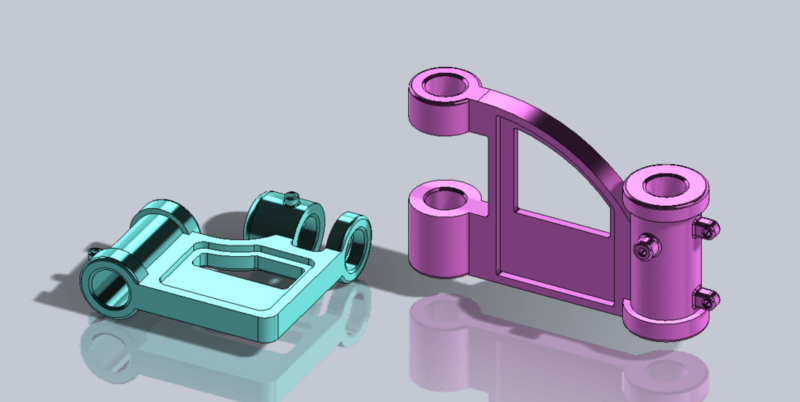 The parts to create will be fairly straight forward, usually with two cylinders connected by a plate. 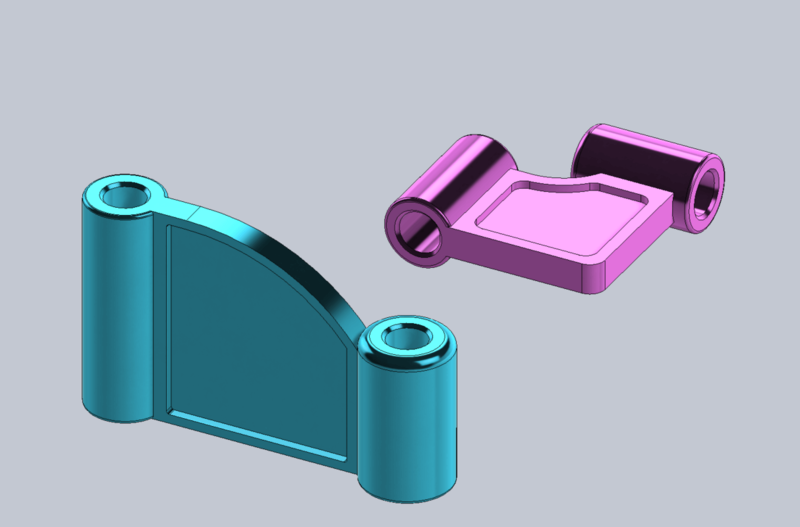 The extrude and extrude-cut features will be used. Previous examples can be seen below. The exam will ask for the mass of the part usually in grams. Once the part is created, there is a mass properties button on the Evaluate ribbon. Make sure you are using the correct units and select the answer from the multiple choice options given. For ease of editing the part in the next few questions, save the part in its current state. Question 2 of the exam will be similar to Question 1, with a drawing and text explanation. The alphabetic variables will have changed. The user will need to go into the equations section and edit the value of the corresponding variables. Just to be safe, go back into the model and ensure that the variables have updated. Once again, the exam will ask for the mass of the part usually in grams, but this time the user will have to input the value. The exam usually gives a 1% margin of error. Again, for ease of editing the part in the next few questions save the part with a different name in its current state. Question 3 of the exam will again present the user with a drawing and text explanation. The alphabetic variables again will have most likely changed, but also a modification will need to be made to the part. Usually another cut is made or a hole can be added like the examples below. Again, the exam will ask for the mass of the part usually in grams. This will be another multiple choice question, so choose the exact answer. Save the part with a different name in its current state. Question 4 of the exam will again present the user with a drawing and text explanation. Just like in question 3 more intricate features will be added. This may involve linear patterns or mirroring of features like below. This will be another multiple choice question, so choose the exact answer. Again, save the part with a different name in its current state. Question 5 of the exam will involve editing the part from Question 4. It will also include a drawing and text explanation. The alphabetical variables will have changed and the user will need to go into the equations section to edit the value of the corresponding variables. 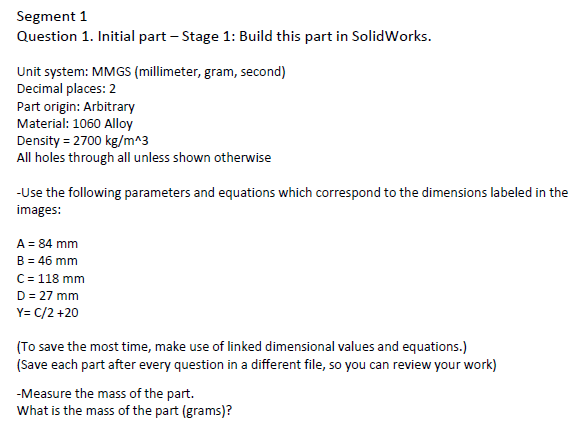 Once again, the exam will ask for the mass of the part usually in grams. This will also be a fill in the blank answer. Remember the exam usually gives a 1% margin of error. Save the part with a different name in its current state. After answering all of the questions, submit your answers. The exam results will be given (almost) instantly. The results will be presented in graph form. The results page will show the topics you are strong in, as well as, topics to study. The results will also be saved in the SOLIDWORKS Certification Center, where you can view a different graph pertaining to the specific topics in the test and your relative score compared to the rest of the users that took the test. Segment 1 will be shown in the “Your Exams” section of the SOLIDWORKS Certification Center and will give the users score, points needed to pass, result, exam date, and duration of time it took to finish the exam. The user will not get the CSWP Certification until all three segments are successfully completed.